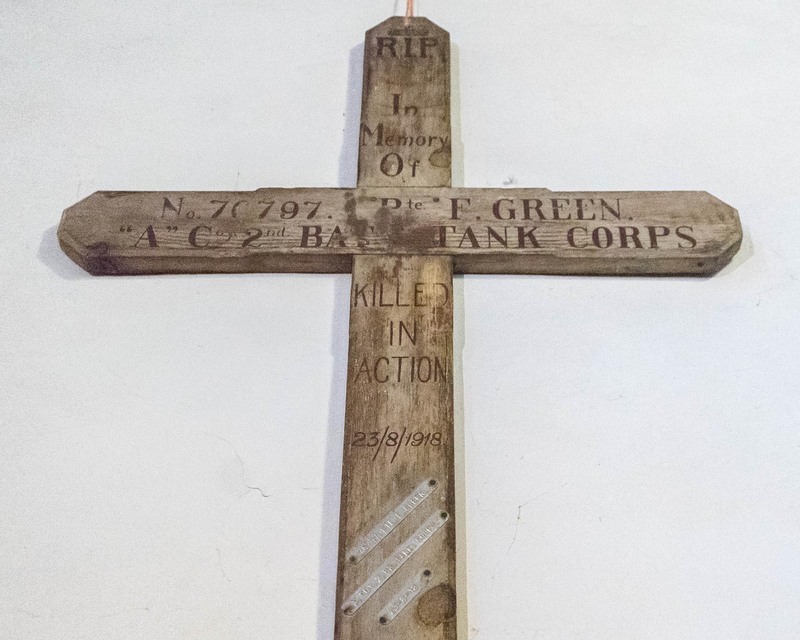 There are three crosses located in the vestry at Holy Trinity, Lydham. 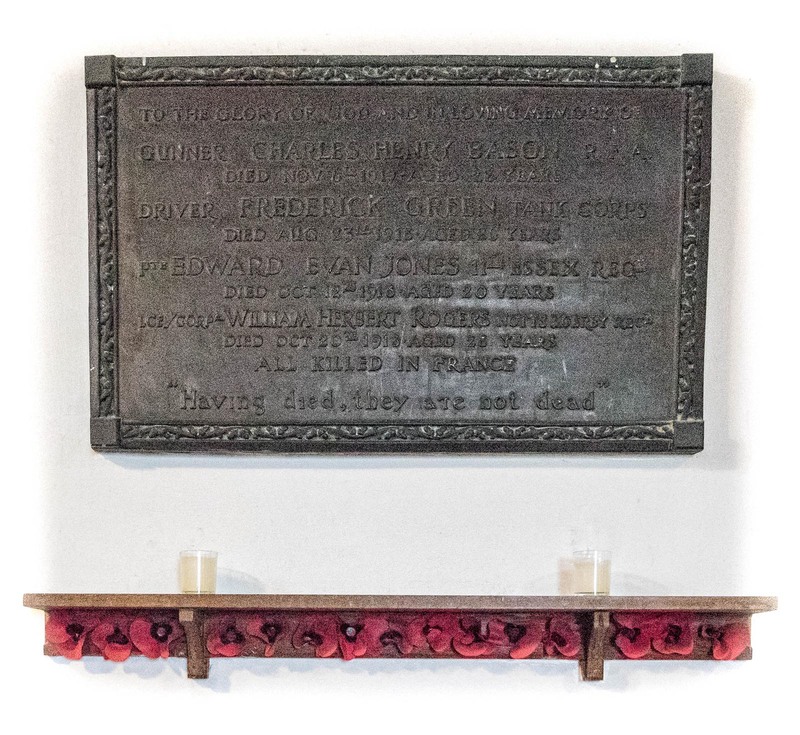 The large grave marker of Driver Frederick Green is mounted on the wall, the other two crosses are propped up against the wall. This is the grave marker of Driver Frederick Green. 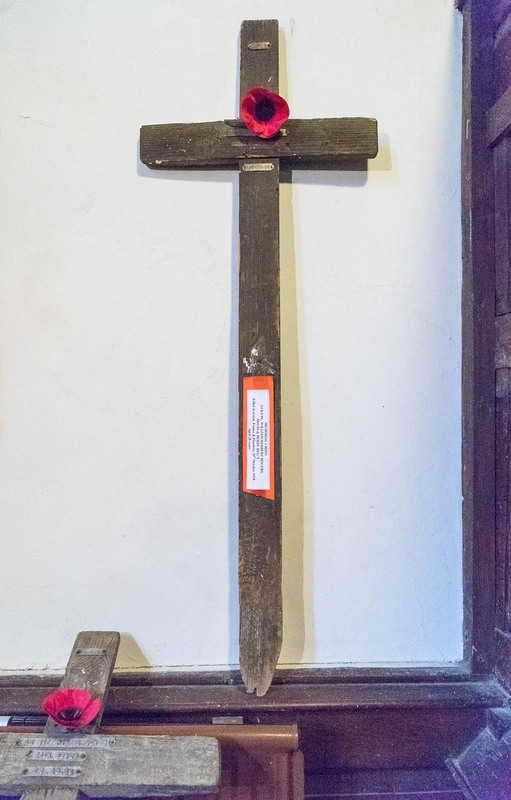 Mounting to wall: The cross is attached to the wall at the top of the shaft by a nail and string. 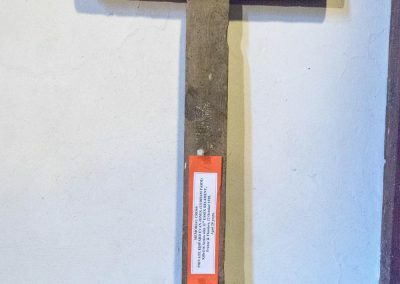 Evidence of use in field (earth marking, cracking, staining, shrinkage): There is evidence of cracking towards the bottom of the cross where it has been in the ground. 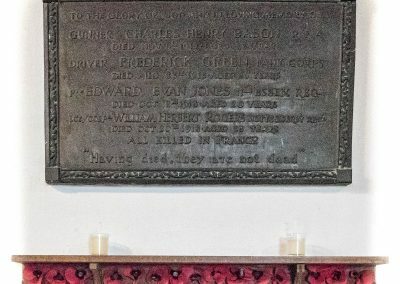 Surface insertion depth (into ground if apparent): 457.2mm in depth. 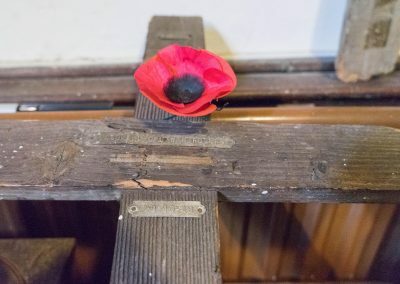 Finish (varnish, paint, oiled, unfinished etc): The cross is light unfinished wood. 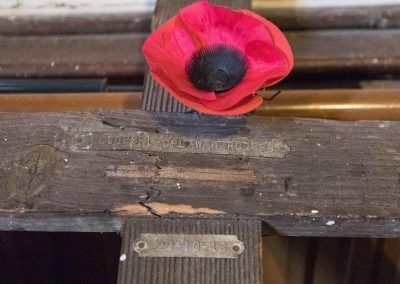 Condition (cracked, paint peeling, woodwork, damage etc): There are some dark marks on the cross, and deterioration towards the bottom. 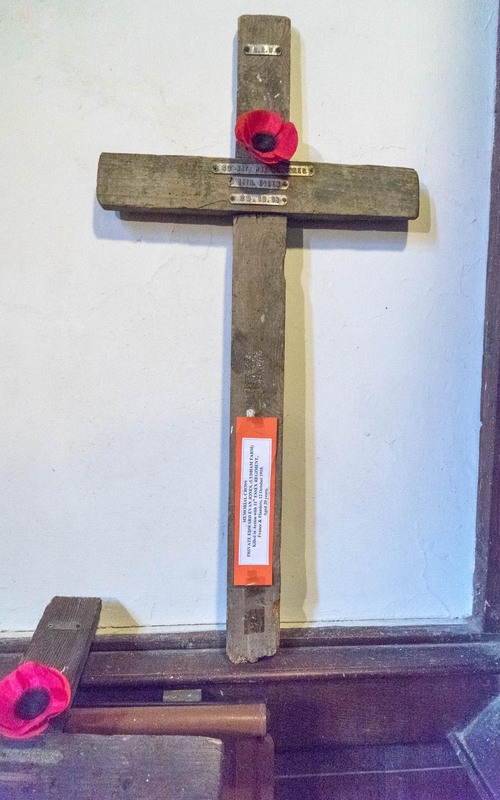 Overall though, the cross is in good condition. 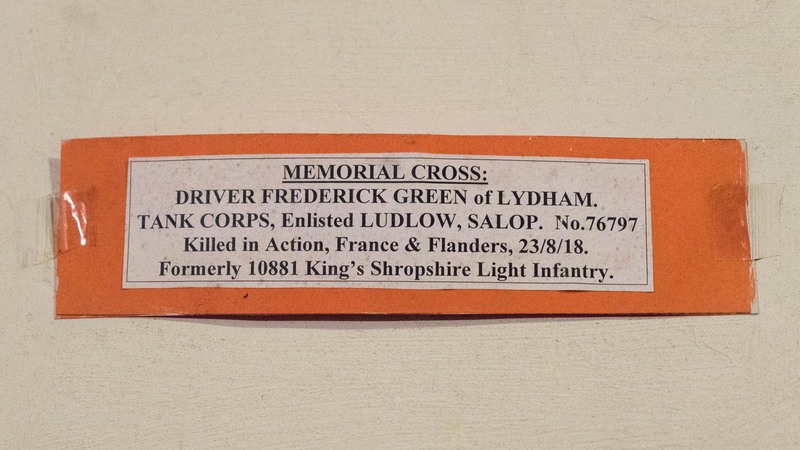 On the wall next to the cross, there is a small orange/white piece of paper which reads ‘Memorial cross, Driver Frederick Green of Lydham, Tank Corps, Enlisted Ludlow, Salop, no. 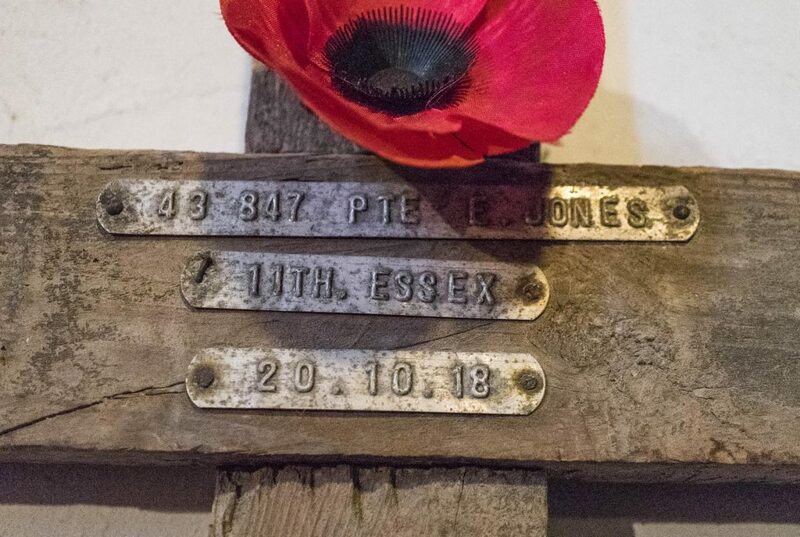 76797, killed in action, France and Flanders, 23/8/18. 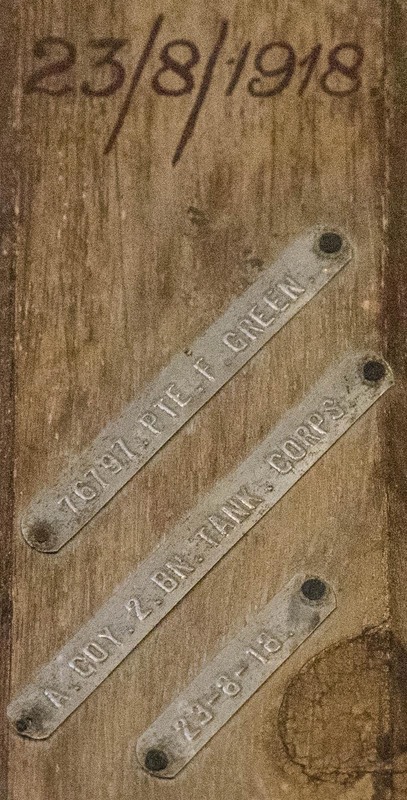 Formerly 10881 Kings Shropshire Light Infantry’. 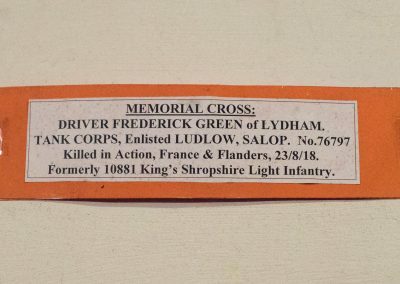 Frederick Green is buried at Heath Cemetery, Harbonnieres, France (Grave ref V.H.8). 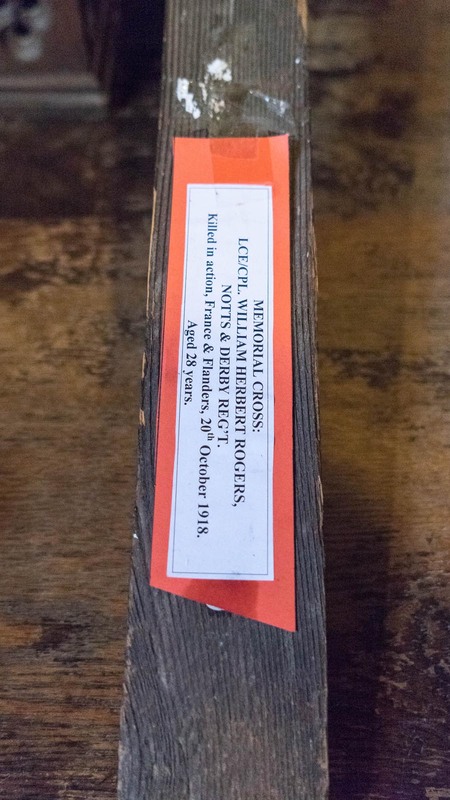 This is the grave marker of Lance Corporal William Herbert Rogers. 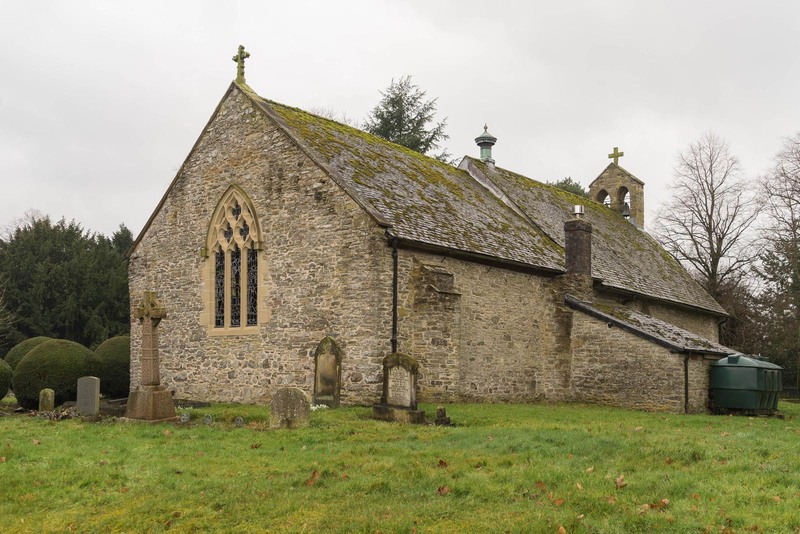 Evidence of use in field (earth marking, cracking, staining, shrinkage): There is deterioration and cracking towards the bottom of the cross. 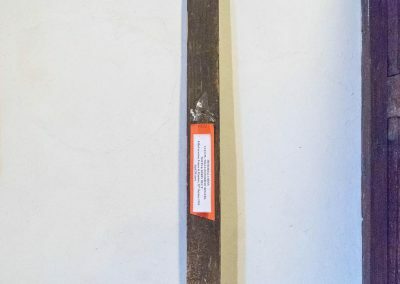 Finish (varnish, paint, oiled, unfinished etc): Dark unfinished rough wood. Condition (cracked, paint peeling, woodwork, damage etc): There is a crack across the cross member, and quite a few paint marks on the cross. 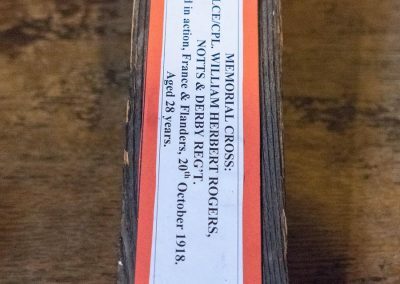 Half way down the shaft of the cross, there is attached a small orange/white piece of paper which reads ‘Memorial cross, LCE/CPL William Herbert Rogers, Nottts & Derby Regiment, killed in action, France and Flanders, 20th October 1918. 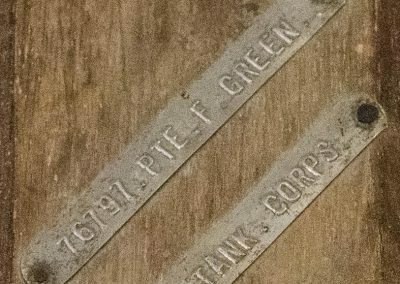 Aged 28 years’. 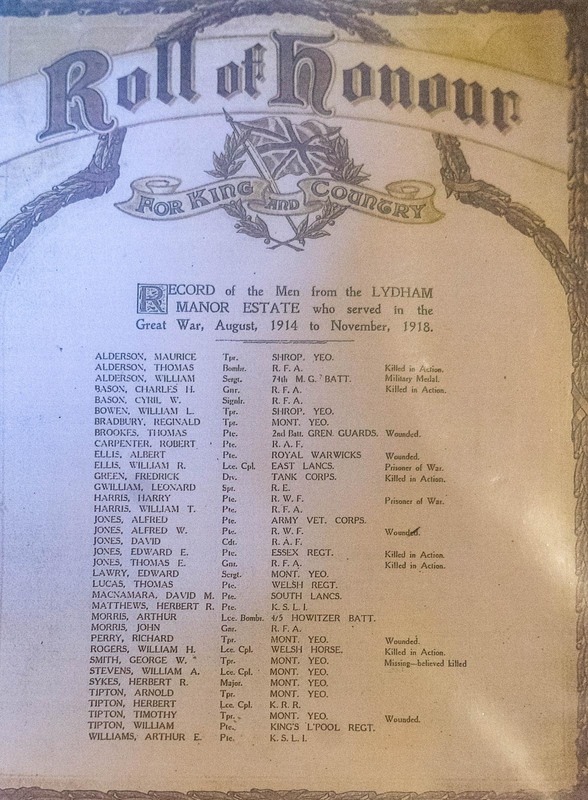 William Rogers is buried at Rocquigny-Equancourt Road British Cemetery, Manancourt, France (Grave Ref XIV.A.8). 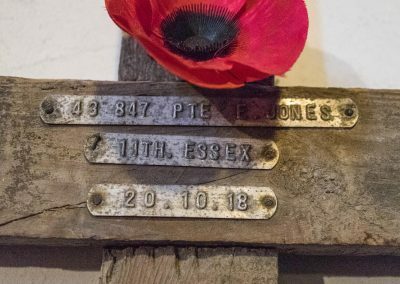 This is the grave marker of Private Edward Evan Jones. 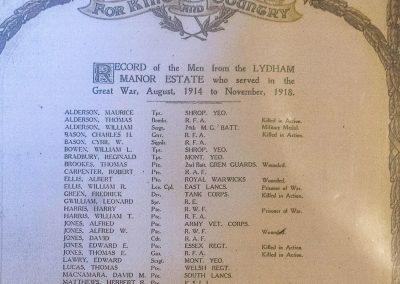 This differs from the GWGC who have his service record number as 43817 and date of death 12/10/18. 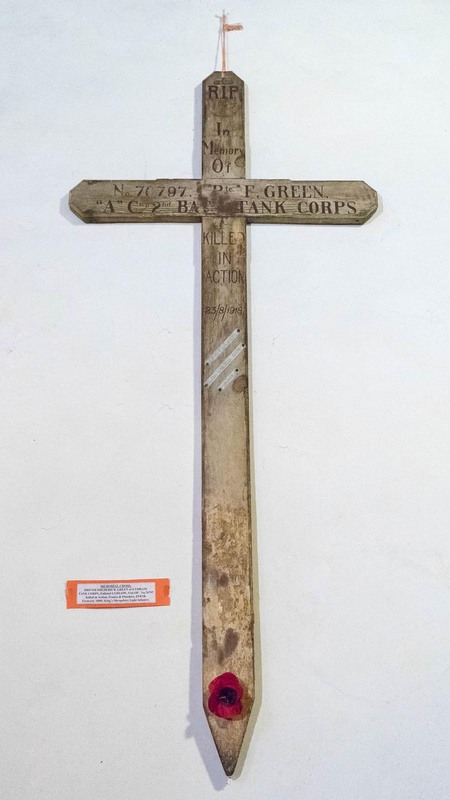 Evidence of use in field (earth marking, cracking, staining, shrinkage): The cross is quite deteriorated at the bottom. 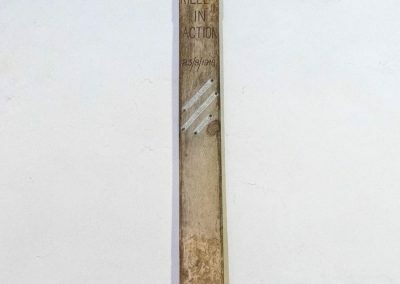 Finish (varnish, paint, oiled, unfinished etc): Light unfinished wood. 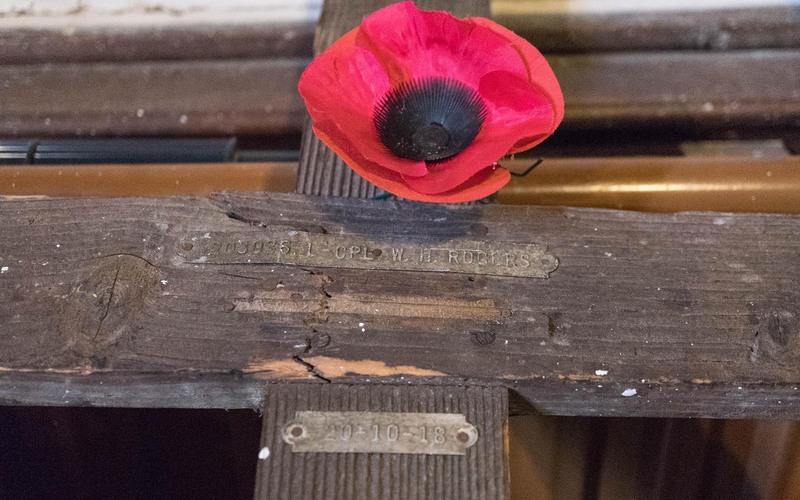 Condition (cracked, paint peeling, woodwork, damage etc): The cross looks to have been cut off at the bottom and is much shorter than the other cross. 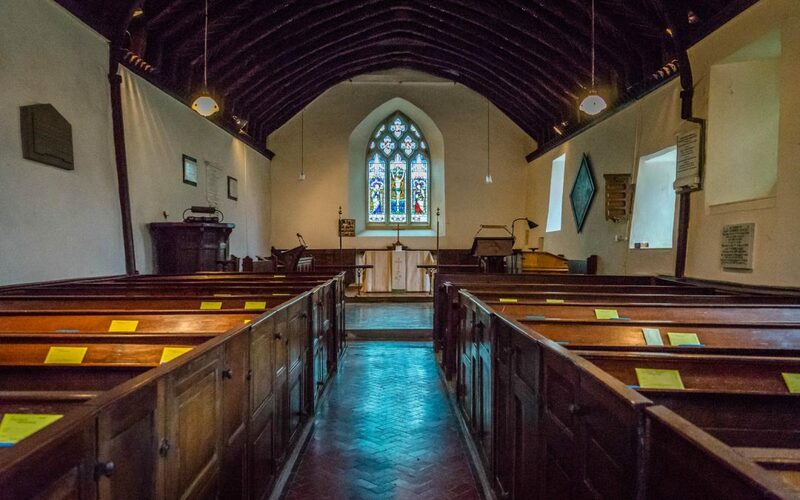 It is cracked in places and possibly has some woodworm. 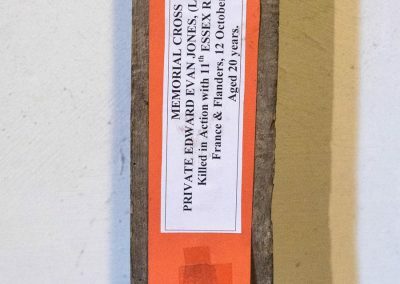 At the bottom of the shaft there is attached a small orange/white piece of paper which reads ‘Memorial cross, Private Edward Evan Jones (Lydham Farm), killed in action with 11th Essex regiment, France and Flanders, 12th October 1918. 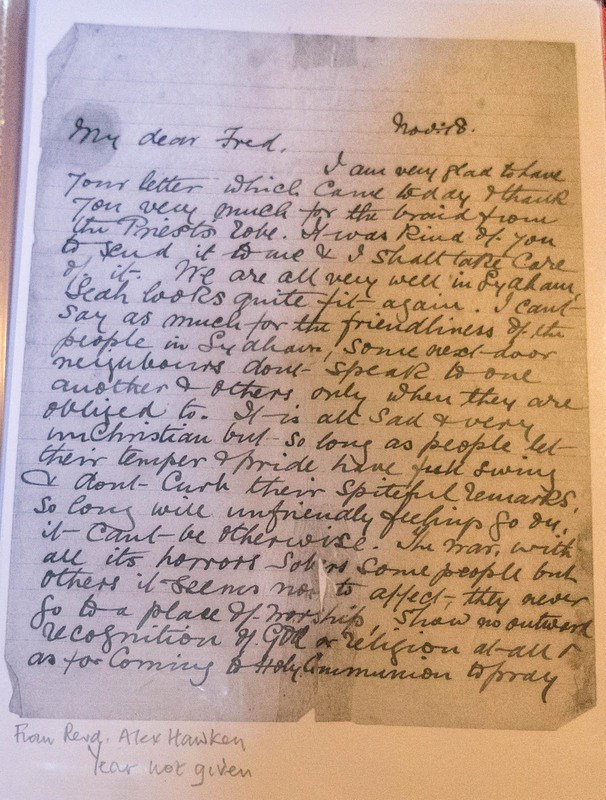 Aged 20 years’. 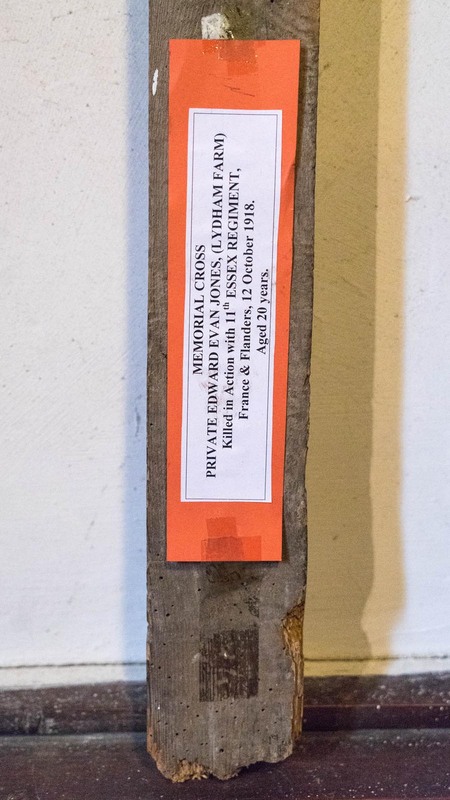 Edward Jones is buried at Vaux-Andigny British Cemetery, France (Grave ref A.25). 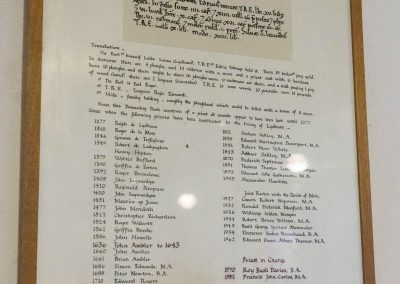 Other information, notes and observations: Gunner Charles Henry Bason (15516, 51st Battery, 59th brigade, Royal Field Artillery) is also mentioned on a memorial tablet at Lydham. 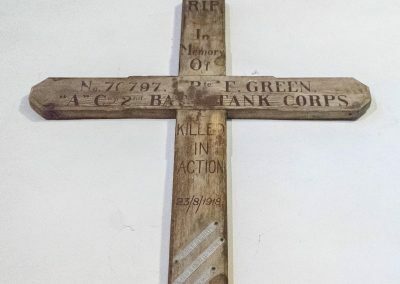 He was killed in action in Belgium on 6th November 1917 and is buried at Bard Cottage Cemetery, Belgium (Grave ref V1.B.15). 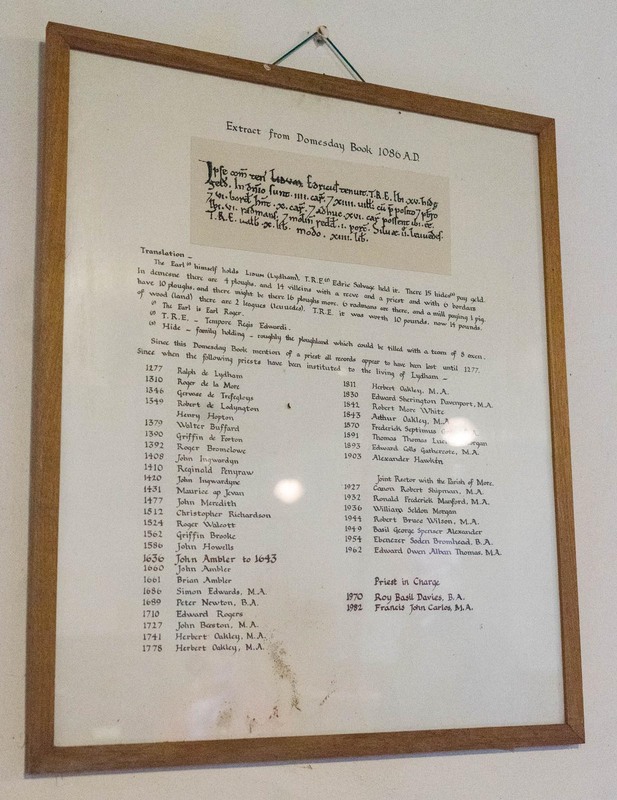 The famous World War One poet Wilfred Owen also has local connections to the area as he lived nearby at 69 Monkmore Road, Shrewsbury. 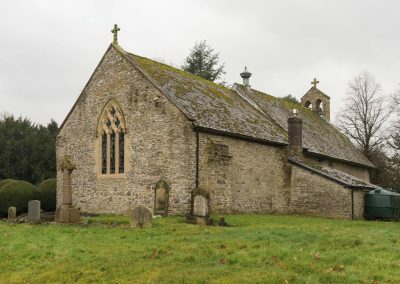 Holy Trinity is a small medieval church built from local stone, and is mentioned in the Doomsday book. 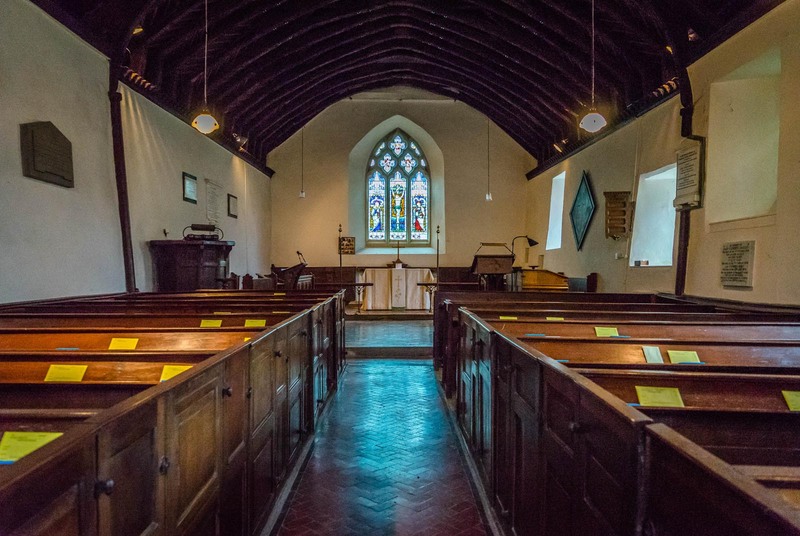 It has a chancel and nave of equal width so that the interior is a single and undivided vessel. 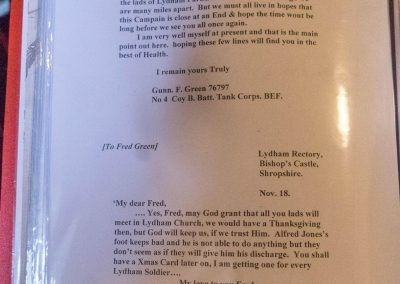 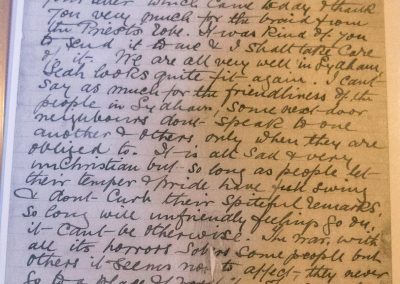 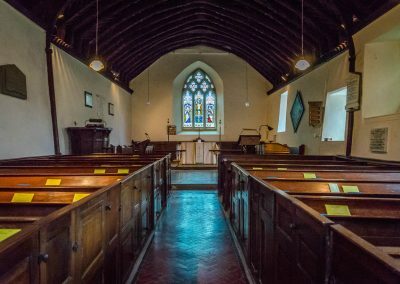 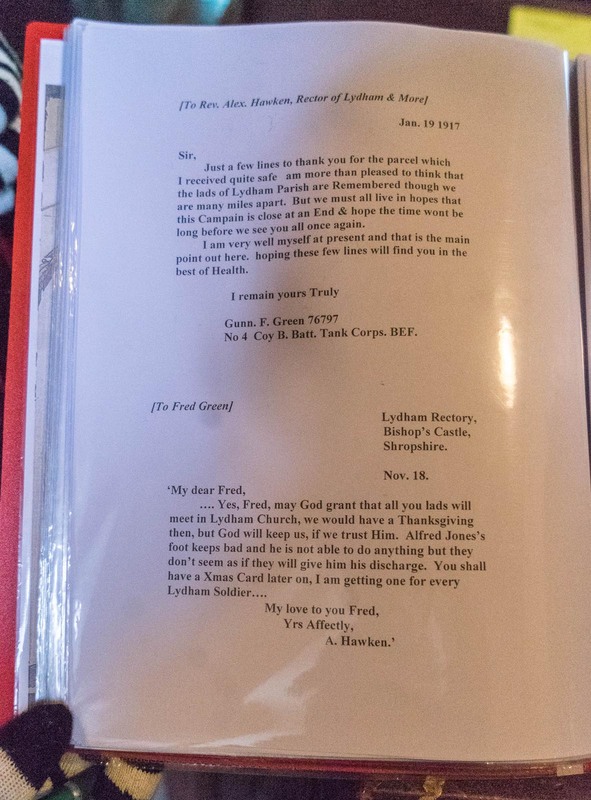 Special thanks to Tony Martin who kindly arranged access to the church for us, and to David Preshous, a local historian who spent time with us sharing the letters between Driver Fred Green & the Rev Hawken (Rector of Lydham during WW1), and his wife too for their hospitality.